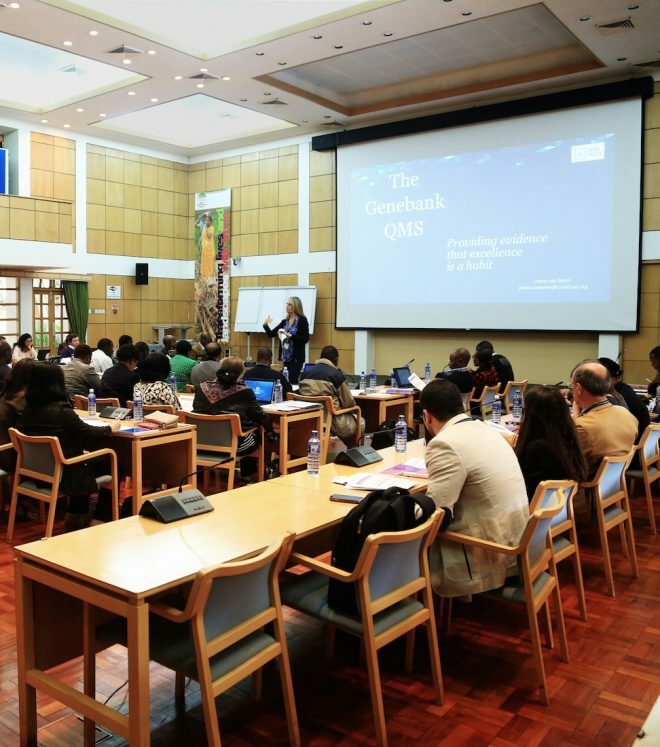 All of the modules of the Platform are supported by activities that aim to strengthen quality management systems (QMS) in genebanks. There is a strong element of mutual support in these activities, as genebanks with more developed practices in any one area share their expertise and experience with others, so propagating the same high standard across the Platform. A genebank’s QMS has two overarching objectives. It defines the necessary activities to ensure that genebanks meet all policy and technical standards and outlines ways to achieve continual quality improvement in the genebank’s administrative, technical and operational performance. As a result, it allows genebank users, regulatory bodies and donors to recognize and confirm the competence, effectiveness and efficiency of Platform genebanks. The QMS applies to all genebank operations, staff capacity and succession, infrastructure and work environments, equipment, information technology and data management, user satisfaction, risk management and operational policies. Each genebank has specific requirements and procedures, but all can use the same approach and templates to tailor QM to their specific crops and conservation methods. Most genebanks have the minimum elements of a QMS in place. In this next phase, the Platform is setting up a system for independent verification of standard operating procedures (SOPs) and the development of new SOPs on phytosanitary processes, information management, and other operations. Yearly improvement plans integrate audits findings, workshop action points, emerging technologies, new standards, visitor recommendations and corrective and preventive actions (CAPA). The QMS addresses all aspects of genebank operations, from the acquisition of accessions to distributing to users and safety duplicating the collections offsite. During acquisition and the preparation of a sample for conservation, the genebank demonstrates that its procedures comply with relevant national and international laws, that they are in accordance with CGIAR and genebank policy, and that technical aspects meet international standards. Conservation procedures ensure maximum longevity and minimum frequency of regeneration, with suitable monitoring and safeguards, and effective strategies for allocating samples to active and base collections. Regeneration takes place to ensure that the genebank has enough seed of adequate viability, using best practices to ensure genetic integrity and maintain seed longevity. Characterisation and evaluation procedures provide vitally useful information to complement an accession’s passport data. The genebank has methodologies for characterising accessions using standardised formats and recognised descriptors. Genebanks also engage in partnerships to evaluate the performance under different environmental conditions, including agronomic traits such as yield, pest and disease resistance, nutritional qualities and tolerance of abiotic stressors. Distribution takes place in accordance with international legislation, so that on request genebanks can supply an adequate sample of seeds or other planting material, free of quarantine diseases. Genebanks keep records of distribution, report to the Secretariat of the ITPGRFA, and follow up to gather information generated from the use of accessions. Safety duplication offsite is essential for all accessions, and procedures are in place to renew safety duplicates when necessary. Information management is a crucial aspect of genebank operations, requiring detailed policies and procedures to ensure the integrity of all data associated with the genebank and its accessions. Backup, recovery and restoration are as important for information about accessions as they are for the accessions themselves. Germplasm health is maintained in conserved accessions and ensures that distributed samples meet requirements for international phytosanitary certification. Because the role of genebanks is to conserve crop diversity for the very long term, it is essential that they undertake a thorough risk assessment. For each identified threat, the genebank has established measures to mitigate the threat. This includes immediate responses, for example in case of a fire, ensuring that genebank staff are fully aware and trained to take on their responsibilities. Risk mitigation also includes a business continuity plan with emergency procedures and a recovery plan. Genebanks make every effort to understand and meet their users’ needs. Systematic monitoring of user satisfaction and feedback – and acting on the results promptly – is a key process in assuring genebank quality. The genebank’s QMS ensures that facilities and equipment protect the collections from damage by unplanned events. Equally, working conditions for staff are monitored for health and safety issues and comply with local regulations. The QMS work of the Platform makes available a series of templates, checklists and briefs for genebanks to use in drawing up their own policies and procedures. Support and training is provided to genebank operations from beginning to end. The independent verification or validation of each genebank’s QM is essential to provide evidence that the genebank follows its documented SOPs and updates them as necessary. Certification represents formal recognition that the genebank has reached a defined threshold of QM implementation and can give all stakeholders confidence in the genebank’s competence. CIMMYT’s Seed Health Lab attained ISO 17025 accreditation in 2007. CIMMYT’s genebank gained ISO 9001 certification in 2013.